This course guide is intended as a teaching tool to help businesses understand the import regulations, the Customs audit procedures and to develop practical business processes and controls for navigating a Customs Focused Assessment (audit). 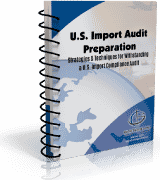 What is a customs audit? How does the process work? What is Customs looking for?